Geoffrey Bond Lewis (July 31, 1935 – April 7, 2015) was an American character actor. Lewis was known for his film roles alongside Robert Redford and Clint Eastwood. He typically played villains. He also played a bodyguard in Double Impact. Lewis was born July 31, 1935, in Plainfield, New Jersey, but spent much of his youth in Wrightwood, California. He took acting classes at the Neighborhood Playhouse in New York City and performed off-Broadway and at regional theaters in Massachusetts. He tried breaking into Hollywood in the 1960s. Lewis appeared in TV series such as Bonanza, Gunsmoke, Mission: Impossible, Mork & Mindy, Lou Grant, Mama's Family, Magnum, P.I., The A-Team, Murder, She Wrote, The X-Files, Highway to Heaven and Law & Order: Criminal Intent. In 1979, he appeared in Salem's Lot. He also played opposite Polly Holliday in the Alice spin-off Flo (1980–81) for which he received a Golden Globe nomination. His film credits include such movies as Down in the Valley, The Butcher, Maverick, and When Every Day Was the Fourth of July. In the '95-'96, 22-episode run of series Land's End (TV series), he co-starred with Fred Dryer. Lewis worked frequently with actor-director Clint Eastwood in several films including Midnight in the Garden of Good and Evil, Pink Cadillac, Any Which Way You Can, Bronco Billy, Every Which Way But Loose, Thunderbolt and Lightfoot, and High Plains Drifter. In the 1980s, Lewis was also a member of musical storytelling group Celestial Navigations with musician and songwriter Geoff Levin. Lewis was married four times and had 10 children. On April 7, 2015, Lewis died of a heart attack at age 79 in his Woodland Hills residence. ^ a b Slotnik, Daniel E. (April 9, 2015). "Geoffrey Lewis, Actor in Clint Eastwood Films, Dies at 79". The New York Times. Retrieved 2017-08-08. ^ "Geoffrey Lewis – Filmography". The New York Times. Archived from the original on 2012-11-03. ^ Reyes, Traciy (April 8, 2015). "Geoffrey Lewis, Dead: Actor Known For Robert Redford, Clint Eastwood Movies Dies At Woodland Hills Home". Inquisitr. Retrieved 2017-08-08. ^ a b Chawkins, Steve (April 8, 2015). "Geoffrey Lewis dies at 79; actor in several Clint Eastwood movies". Los Angeles Times. ^ Barnes, Mike (April 7, 2015). "Geoffrey Lewis, Frequent Co-Star of Clint Eastwood, Dies at 79". The Hollywood Reporter. Retrieved April 4, 2018. 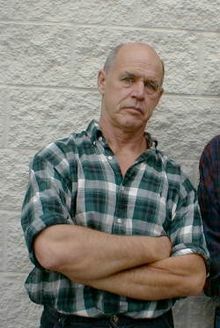 This page is based on the Wikipedia article Geoffrey Lewis (actor); it is used under the Creative Commons Attribution-ShareAlike 3.0 Unported License (CC-BY-SA). You may redistribute it, verbatim or modified, providing that you comply with the terms of the CC-BY-SA.